Most people who are doing powerlifting at Vector Health had never heard of the sport before it was mentioned to them. In the past 2-3 years, Powerlifting has undergone a revolution of sorts, and has become more popular and mainstream due to the increased focus on resistance training to increase health and fitness overall. 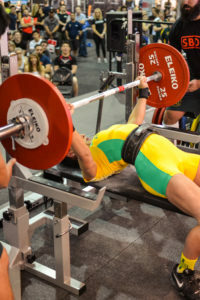 Powerlifting is a combination sport – you have three specific “lifts” you need to do in a full competition, or you can just bench press. The squat is one lift, the bench press is second and the deadlift is third. You have three attempts and the most you lift in each attempt is added to form your Total. This is what counts. How much you can lift when you combine your best squat, bench press and deadlift. There are rules and regulations and different ways to powerlift. We usually go through this with you when you come in for a chat if you are just starting. The great thing about Powerlifting as a sport, is for a time-poor person you get to do your training for sport in the gym. This means you can go to the gym 3-5 times a week, and then compete on weekends and you do not have to go anywhere else to train for your “sport.” It’s a sport where you can set individual goals and work on achieving them, but still have the fun of qualifying for state and national championships if you want to progress and push yourself further. What can Powerlifting Coaching do for me? No, you can train, test and train if that is enough for you to have fun! We run gym-testing competitions if you do not have the time, or do not want to compete officially! 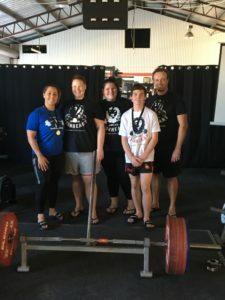 What has been our success in Powerlifting? (Samantha Thomasson, breaking her first world record in the bench press in 2015). As head coach, I have just as much satisfaction coaching someone who is just starting as someone who is trying to be the best. It is a fun sport, it is a sport that you really have some great control of, and I would really recommend it to someone who loves the gym, but does not necessarily have a sport to do.